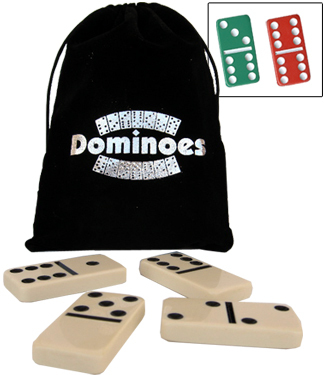 These Double Six Domino Sets come packaged in Black Drawstring Velveteen / Velour Bags that have a unique Metallic Silver Dominoes design on the front of each Bag. Three domino tile colors are available: traditional ivory with black dots, green with white dots, and red with white dots. For additional information on any of our Dominoes Sets in Drawstring Velveteen Bags, please contact us at 1-800-233-0828. You might also be interested in our Double Six Dominoes Set in Wood Boxes and Double Six Dominoes in Vinyl Cases.